(KLIX) – The Idaho Transportation Department is launching a campaign to raise awareness about the Star Card program. The department said so far only 5 percent of Idahoans have applied for the card, which in the Gem State is named Star Card-Idaho’s Real ID. Without it on a driver's license by Oct. 1, 2020, citizens won't be able to board a plane or enter a federal facility. At that time the Department of Homeland Security will require a Star Card or other approved credential such as a passport to get through security at airports, courthouses, and military bases. To date, 70,000 of 1.25 million licensed drivers in Idaho have a Star Card, according to the transportation department in a news release. In an effort to help raise awareness about the ID card, the Department of Motor Vehicles is launching a multi-faceted campaign that includes videos, advertising in Idaho airports, and on social media and travel sites. The REAL ID Act of 2005 was enacted by Congress as a result of the 9/11 Commission’s recommendation that the government “set standards for the issuance of sources of identification, such as driver’s licenses,” according to the news release. 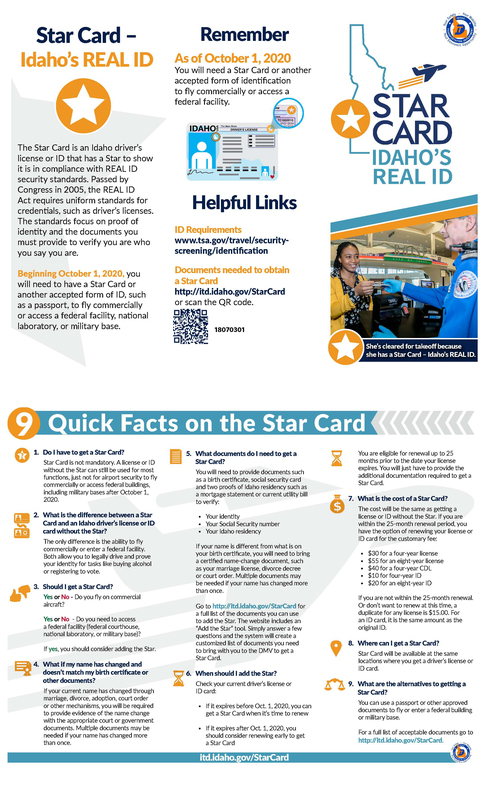 You can learn more about Idaho’s Star Card here.